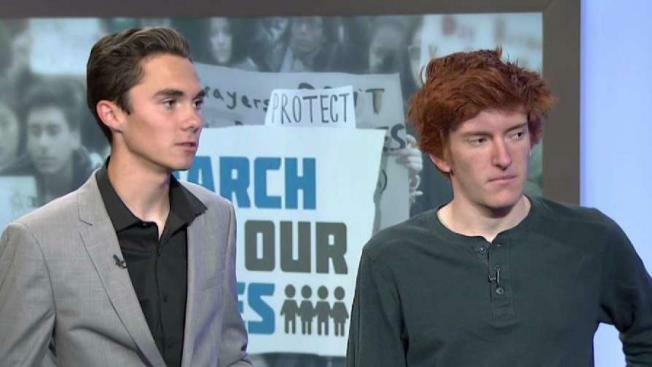 The Parkland, Florida, teens spearheading Saturday's March For Our Lives rally in Washington are being hailed on the cover of Time magazine. Standing above the words "ENOUGH," the cover features Marjory Stoneman Douglas students Jaclyn Corin, Alex Wind, Emma Gonzalez, Cameron Kasky and David Hogg, representing a student-driven movement for tougher gun regulations. The corresponding story, titled "The School Shooting Generation Has Had Enough," chronicles how a group of vocal and internet-savvy teens have shaped the gun control debate in the weeks since a gunman killed 17 people at their high school on Feb. 14. "The adults know that we’re cleaning up their mess," Kasky, an 11th-grader at Marjory Stoneman Douglas, who started the #NeverAgain movement in his living room, told Time. "The world failed us," he added. "And we're here to make a new one that’s going to be easier on the next generation. If you’re against that, then get out." In tweets, on TV and at rallies, they publicly urge and shame elected officials in Washington and in Florida's state capitol to improve school safety and keep guns out of the hands of dangerous people. And they've made some strides. Four states — Oregon, Rhode Island, Washington and Florida — have taken steps to change laws relating to guns and school shootings, the most sweeping passed in the students' home state. Florida Gov. Rick Scott signed the "Marjory Stoneman Douglas High School Public Safety Act" on March 9. The measure raises the age to buy all firearms to 21, imposes a three-day waiting period for most gun purchases, allows trained school workers to carry handguns, provides new mental health programs for schools, and restricts access to guns from people who show signs of mental illness or violence. The Parkland shooting kicked off a wave of activism. Last week, students nationwide walked out of their schools to demand legislative action in Congress. On Saturday, hundreds of thousands of teens from across the country will descend on Washington, D.C., to participate in the March For Our Lives. Dozens of sisters marches are also taking place Saturday from California to Maine. Back in Miami, the organization Sandy Hook Promise honored Miami-Dade County Public Schools on Wednesday for its efforts to train students on how to identify and help at-risk students before violence happens. More than 3 million students have been trained across the U.S. The group says it has helped avert multiple school shooting plots, several teen suicides, and other acts of violence.